Overture is a funny beast. I have found that the traffic that actually comes from the Yahoo! search engine converts really, really well. However, Overture doesn't let you opt out of their "partner site" traffic, which is almost universally garbage, and they won't do anything about it. 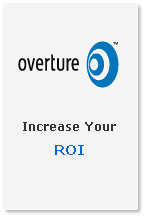 You can still maintain a healthy ROI at Overture, however it requires a bit of work. Certain words are targeted by these "partner sites." It is normally the high volume, high cost keywords that these shady sites will target. For instance, if you put yourself in the #1 spot for "home equity loan", you will see a tidal wave of traffic from sites that were clearly just put on the web to generate clicks. Meaning, I am pretty sure that the owner of the site is just sitting there, clicking on the links. The ROI is always nil with these clicks. So they just target these high profile keywords I find. Long tail keywords, such as "home equity loan for home improvements", for instance, wouldn't be targeted by these fraudsters. It slips under their radar. If you are going to use Overture successfully, you have to target the long-tail keywords, and avoid the high profile searches if you wish to maintain a high ROI. MSN and Google are different because you know that the quality of traffic from these outfits will be quality; with Overture, they do not police their "partner sites" well at all, so it behooves us to make changes in order to maintain our Return on Investment. My advice is to review your site logs every day (if you use Cpanel, then just click on Web Stats, then click on Latest Visitors.) Examine your traffic being sent to you from Overture as it comes in. Do you notice a keyword or two that seems to be searched over and over from a site such as primosearch.com, which is a known spyware site that Overture refuses to remove from their list of partner sites? You probably want to either lower the bid on this keyword at best, and completely take it offline at worst. If you keep pruning your list, eventually you will find that you will have removed probably 15-20 keywords, depending on the size of your campaign, that were clearly being targeted for fraud by these "partner sites." You will be left with a really good list of keywords that you can go forward with, and your Return on Investment will soar.